Includes 4 Stainless Steel Blades for Thick, Thin, Ribbon or Sliced Veggie "Pasta" or Chips! The electric spiralizer that makes creating veggie "pasta" super fast and easy! Dishwasher safe. From the makers of the original Veggetti comes Veggetti Power! Now making healthy "pasta" out of veggies is even easier than before. 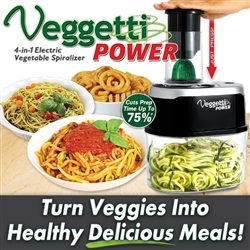 The new Veggetti Power is the electric spiralizer that turns your favorite veggies into delicious meals. In just seconds you can create healthy vegetable pasta, curly fries, fruit slices, sweet potato chips and more with Veggetti Power. Simply place the vegetable in the cone, press the button and push through. Veggetti Power's stainless steel blade and powerful rotary motor powers through veggies and fruits super fast, cutting prep time up to 75%. Includes 4 different blades- thick, thin, ribbon, or slicing blades. Veggetti Power features a large 1.5 qt capacity container a wide-mouth feeder with a food safety holder and easy on/off button operation. Dishwasher safe. 8.7" x 6.2" x 13"; includes recipe guide.